Sometimes, you just know what the name of a piece is going to be before you start. I like to say my pieces I work on, "talk" to me. I am sure you decorative painters know what I mean. This was definitely one of those chats. This desk was in need of a redo for sure. I wish I had a "before" photo to share with you. It was evident this was a sturdy maple piece from the 20's or 30's. I wanted to honor the wood tone and redid the top with a natural finish. I did put a walnut stain into the wood and finished it with several coats of polyurethane. I figured this would give a durable finish in order to protect it from use as a desk. I then proceeded to make my own "chalk" or clay based, paint. This is not for the faint of heart, I can assure you! I measured carefully into a large mason jar two tablespoons of non sanded grout. I mixed with water to a creamy consistency, and then added my cup of paint. I had a flat finish latex that was a Martha Stewart color from her old line at Home Depot. The color was Pumpkinseed. I thought it would be perfect as an accent to the hardware I found at Anthropologie. As this project required several applications of my homemade "chalk" paint, I kept careful notes of how much paint vs. grout vs. water. I did have to remix once. After a day or two, my homemade "chalk" paint resembled jelly more than paint. There are other recipes, this was the one I started with, and I will try more and maybe even this one again. 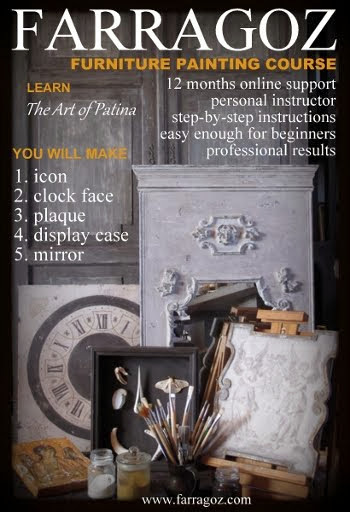 However, now that we are carrying the Paint Couture Line of project paints, that is giving me all the tools I need to do the finishes I want to do. 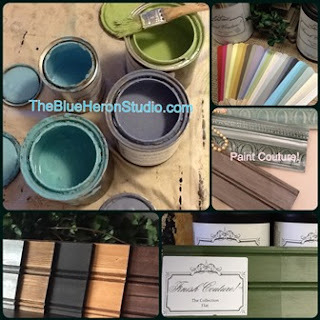 You can find out more about that line of paint at www.theblueheronstudio.com. if you like. 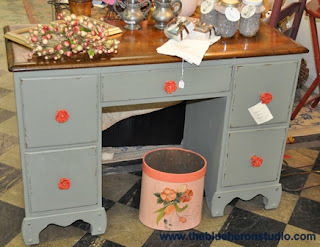 I did finish the entire project with two coats of Miss Mustard Seed Furniture Wax which goes on like butter. 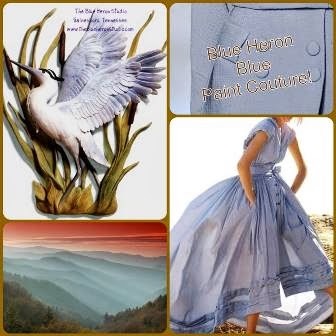 We also carry that line at The Blue Heron Studio's website. I used clear as I wanted the foliage green of the color to stay true. For a pop of color, I finished the inside of the drawers with a bright color that I had mixed off the color of the knobs. As I am doing some new items with metallic finishes and glazes, these mercury glass knobs will probably show up on a redo soon! 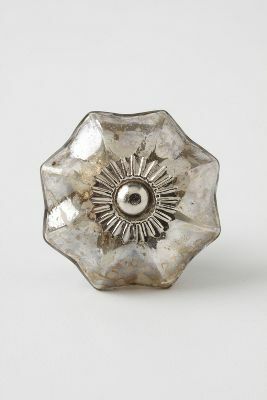 The knobs at Anthropologie can be pricey, so I try to wait till I have a coupon or some free shipping, etc. offer. They are beautiful and inspire a lot of dreaming! 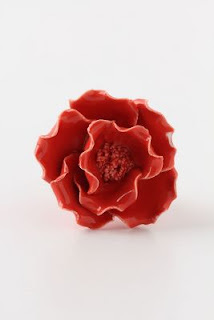 I am sorry that I have not posted in a while, but I have been busy working on many new items to share with you, and hopefully will be a better blogger! Remember, go out and have some fun, and "If it stands still, Paint It!"